The beginning of summer often means aquatic sports for both humans and their beloved canine companions. Most dogs absolutely love the water and can’t wait to dive right in. Maybe it’s a family picnic at the river or lake, a day out on the boat or perhaps even the pool in your own backyard that you choose to cool off form the warm summer sun. Perhaps you’re lucky and have a doggy aquatic center specifically meant to help your dog get some aquatic aerobics as another means of exercise and fun. No matter where you decide to go swimming with your dog, precautions should be taken to keep him safe. A life vest made just for dogs is one way to keep your dog’s head above water while he enjoys his doggy paddling exercises. There are many to choose from, you can find a whole list of them HERE. When you’re out on the boat with your favorite canine companion or swimming in the family pool, the last thing you want to worry about is your dog going under or being swept away by the river and not coming back up. 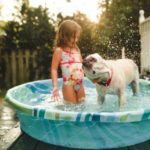 A life vest is usually a brightly colored nylon covered floatation device that keeps your pet’s head above the water, easily visible, and even has a handle for quick retrieval. The peace of mind you receive through just attaching one to your pet is worth far more than the monetary price you will pay for one. Furthermore, the bright colors help even for hunting dogs that retrieve from water sources. It keeps your dog visible to you and other hunters while keeping him safe from drowning in any deep bodies of water. This is especially important for dogs who hunt with their owners for water fowl such as duck and geese in which the game is often dispatched over a water near wetlands, rivers and lakes. 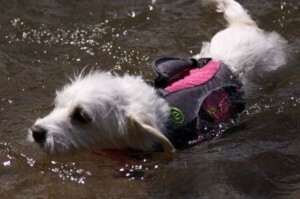 I found this cute pink dog lifejacket while searching around. 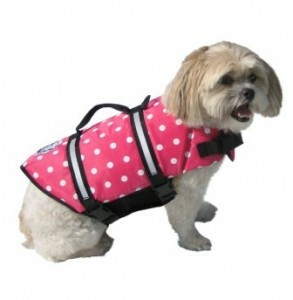 It is called the Paws Aboard Polka Dot Doggy Life Jacket. To bad we have a male dog because this one is very cute. It is cheap (under $15) and has over 100 reviews with people giving it 4.5 or or 5 stars. Not all life vests are made the same. 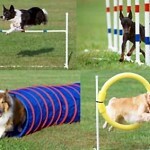 When searching one out, you want to make sure it has been tested on various sizes of dogs, is lightweight, comfortable, not obtrusive on your pet’s natural movements and most importantly will keep his head above water if a current should take him, he gets tangled in anything in the water or if he becomes exhausted and begins to sink. Your dog should be able to float without needing to paddle and struggle to hold his head up with a life vest on. Cost does not always mean better quality in most products, but the quality of a life vest is often times directly correlated to the price you’ll pay for one. 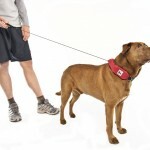 The higher quality vests will have quick release or breakaway straps for emergency situations in which the vest gets tangled in debris or aquatic plants and the dog gets stuck. Releasing him of the vest at that point is a safety measure to get him out. You also want to find out that is made of materials that dry quickly and do not lock in any moisture. Your dog should be able to wear the vest easily in and out of the water, and locking moisture against his skin and coat can lead to bacterial or fungal infections. Many top brands offer products to add on to some of their better quality life vests including back packs to hold items from water bottles to ID information, heating or cooling packs, weight packs for exercise, and more. While none of these are required for your dog to enjoy his day by the water, they can help in certain circumstances, such as long hikes in which he can help carry your drinking water or lost and found information for a hunting dog. 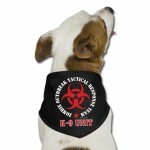 The above one is the dog lifejacket that we are going with. It is on order now. There are many large sized lifejackets for dogs, but this one has the reflection and safety options we want. This style has 4.5 reviews of just 35 people. I will post my own review after we have used it all summer. 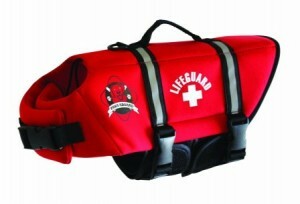 It is called the Paws Aboard Large Neoprene Designer Doggy Life Jacket, Red Lifeguard. Any and all breeds should wear a life vest when near large bodies of water for protection, but small dogs may gain the most use from them. Small dogs do not have the strength to battle against a flowing river or undertow from a large lake and may exhaust themselves more quickly. Even in the family pool a little dog can tire more easily and need a break. The life vest helps take away some of that stress of swimming as well as ensures his safety. Labrador Retrievers, Poodles, Portuguese Water Spaniels and many more breeds may have been bred to love the water and be strong swimmers, but all dogs of all breeds deserve to have that added benefit of a life vest. As the owner, you deserve that peace of mind to know that you dog is safe and protected while getting the most out of his water experience. «The New Puppy Checklist! Are You Prepared?